I was visiting my favorite place to shop, Goodwill when I spied a gorgeous chair in a style that I've been looking for. I almost did the happy dance right then and there, but not wanting to embarrass myself I refrained. However a tiny squeal did manage to sneak out. I was even more thrilled when I spied the price... 19.99 say what? could this be true? I was happy until I went to check out and the lady I've nicknamed The GW Police was working the check out. Rut Roe, this lady has refused to sell me things on more than one occasion because she believed they were improperly priced. Holding my breath and gearing up for an ugly fight I approached the check out. Sure enough she was hesitant about the price. I pointed out the load of chairs sitting there... all priced at 19.99. With a pained expression she gave in, can I just tell you this woman gets on my last nerve. I'm beginning to wonder if she wants to keep the good stuff for herself. Anyway all's well that ends well and I got my chair. May I add that several ladies were shocked and appalled when I told them that I would be re doing the chair. I must confess the chair was in perfect condition so I can kinda understand where they were coming from. Here is the chair in all of it's before glory. I bought the script fabric from JoAnn fabrics on sale for 50% off plus another 25% off the total purchase, so one yard of fabric cost me about 8.00. it was 24.00 dollars a yard originally. The back is covered in osnaberg that I had on hand. I printed the frame graphic from the Graphics Fairy and transferred it using iron on transfer paper. I created the silhouette by printing a vintage picture and cutting it out, I then used the negative part of the cutout as a stencil. I used black craft paint and a textile medium to stencil the image in the center of the frame. 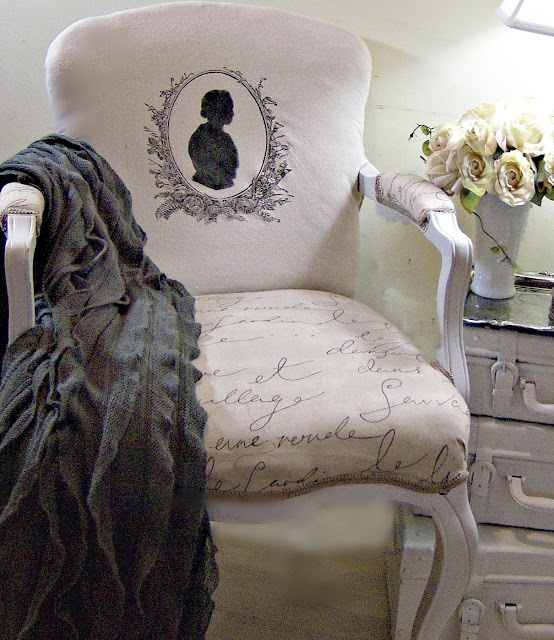 The chair is painted in a gesso and paint mixture that I learned from the super talented Rosemary at Villabarnes. The paint color is Sharkey Gray. I'm really happy with the way it turned out, even if the old batting is a little lumpy. The total cost of the chair is about 36.00 dollars including the cost of the trim. Not bad for a whole new look. I love this! What a deal..but Goodwill is surpose to be a deal! Around here I frequent about 5 Goodwill and they all know me and honestly I think they want me to get a deal. I am nice to them and never hassle them so I guess that is why. There is a speical lady at one of them though who I can imagine would question the price on the chair. I was told they are not allowed to buy anything until it has been there a certain amount of time. So I could never work at Goodwill because I usually get things as soon as they come out. :) Congrats on your find and your beautiful re-do job! Wow Karen, where do I begin?! Beautiful makeover! I love the script fabric and the silhouette! It looks so pretty in your room. I love the pillows on your sofa too. Very shabby chic!! And what's up with the Ms. Goodwill? Maybe she acts that way because she wants the stuff for herself?! Glad you walked away with the grand prize!!! Wonderful! The fabric alone would make you swoon! Oh my goodness, what a stunning transformation! Your chair is beautiful! Great makeover - we'll worth the minimal investment! Wow, Karen, this chair turned out beautiful! I have a chair very similar to yours that was my grandmas. I have it covered with a lace table cloth. Hummm, I love your idea. I might try this. I also wanted to add my sincere condolences on the loss of your dear brother. I lost my mom to cancer also 18 yrs ago. The chair turned out beautifully. Great job! No flipping way? Gorgeous, just gorgeous! What's the GW police ladies problem? I bet you are right, she knows you score good stuff, ha if she could see it now, she would but a blood vessel in her eyeball! I meant bust a blood vessel. Oh my goodness! That chair is stunning! Takes my breath away. You did a marvelous job re-doing it. I have met some of those GW police myself. What's up with that? So glad you got the chair! Wow! That chair is gorgeous! Very well done!! I know what you mean about the GW Police. They are EVERYWHERE!! If I go to the good will, they always question my items! And my mother lives in Florida and the GW police have refused to sell to her! They need to be stopped!!! Again, your chair is awesome! That is fabulous! Love your other furniture I see there, too. Thanks for sharing this at Wow. I have a Goodwill by me but all there seems to be is clothes. I wonder if I should go back. The chair transformation is fantastic. From what I can see your room is gorgeous!!! Your chair looks awesome!! Thanks so much for the shout out. I'm amazed at the job you did. absolutely FABULOUS~! I adore it. Wow! What an incredible makeover! I love how you redid that chair. That is SO pretty. I'm stopping over from Wow us Wednesday's. i think mean goodwill lady would be dying right now if she saw your chair! Beautiful! You are a very talented lady and you were lucky to begin with for getting this chair for a steal! Love the way you did it, fits perfect with your interior! Wow it is so gorgeous! You did great! Great job! It looks so very handsome! What a good price! WOW... what a great deal! Those ladies had no idea what that chair would end up looking like! Thanks for sharing at my party. Beautiful transformation! It is gorgeous, and I love the fabric! ~Coming from Wow Us Wednesdays! What a lovely chair and what a great price! I love it, you did a wonderful job! The after is sooo much better than the before! Isn't it funny when people are shocked that you are going to redo things? I quit telling people that I plan to paint my Craigslist furniture finds.They often tell my how beautiful the wood is and I'm thinking..."that would look great painted in "xyz" color. Yes, yes a thousand times yes - your chair looks so much better! You did a great job and it was so interesting reading about the process. Thank you for all the great links as well. Great Job! Karen, Gorgeous!! I am in love with the upholstery and the chair. The silhouette is beautiful. Thank you for linking your fabulous chair transformation at the Open House Party. Oh Karen it's just beautiful! Yes it was lovely before but I can see exactly why you chose to change it up a little. It looks perfect in your room! Omg I'm in love with your chair. I would pay you to make me one!! What a fabulous job you did!! I would be interested in knowing the GW stores you shop in! Love what you did. Gives me a vision for the frame sitting in my garage!! What a fabulous find! The chair is really beautiful. I'm a fan of the script fabric...nice choice. What brand is the paint color? One word - WOW! I love the whole room. I'm your newest follower! I love what you have done with it, you have great style! I would really like to find one of these (or two) but they NEVER show up on Craigslist and my Goodwill is not very good. I guess I'll keep looking and hoping! Thanks for visiting me! Great vision and such a beautiful job! So Gorgeous!!! We're working on two very similar chairs at the moment (found for free on the roadside by my friend's girls.... they have amazingly discerning eyes for kiddies!) Thought I knew exactly what direction we were going but now I'm thinking we should rethink! Your chair turned out great! Love the silhouette. I have two chairs almost identical - the fabric is a little different. I have been thinking about re-doing mine also and they are actually in good shape, just out-dated. Thank you so much for sharing this! You're chair is beautiful and I am inspired! I absolutely adore your chair. I love the idea of using two different fabrics, one on the seat and the other on the back. I plan on doing a makeover like that, too. I also love the Waverly Pen Pal fabric...own several yards of it myself. Great job on your project! WoW! She sure is pretty!! Love it! I am on the hunt for a similar styled chair as well! Oh, this is the most beautiful chair I ever seen. It was a beautiful chair before, but your transformation is just perfect and I love it even better after. Great job! And isn't Rosemary at Villabarnes the most creative person with her amazing range of paint finishes? I'm a huge fan! Oh, forgot to comment on the GW police woman. What a "rhymes-with-witch"! But you know what? I'm "witchier" if you know what I mean, and she would rue the day she tried that crap with me! I would demand to see a manager, then I would openly point out that she is attempting to bait-and-switch and then state firmly that they cannot legally price an item and attempt to raise the price on it the minute someone shows interest and wants to buy it. I'd also accuse her of doing that so she can snag the pieces for herself, and would probably threaten to notify the GW main office of their tactics. But then I'm not afraid to make a total scene, and often people like that just cave in because they want to get rid of me LOL! Tossing out the words like "bait-and-switch" and "unethical pricing tactics" might make her see the err of her ways. Regardless, you got an amazing deal on that chair. I am in Los Angeles, and our thrift stores here are anything but "thrifty" in their pricing. Was at a St. Vincent de Paul with a friend and we were looking at furniture, and no kidding they wanted $500 and above for some of their wooden armoires that were NOT in good shape. You find that a lot out here, and it rarely makes for a good deal when out "thrifting. What a fantastic deal, Karen! I would never get to buy such a chair for such a great price over here. Your makeover is just fabulous and I love the new look. Gorgeous transformation!!! You did an amazing job! That looks so good, Karen! A chair like that is on my mental list when I'm out and about, too. I have that fabric you used on the seat! That woman sounds like a horror. Is she in charge or just works the register? She really can't decide that its not priced right and not sell it when there is a price on it. How beautiful! I know what you are talking about with the GW police comment. I am not sure what is wrong with (some)people that work there getting attitudes or thinking the prices should be different. I think they should be happy that money is being made for their cause and that in the end is the most important thing. 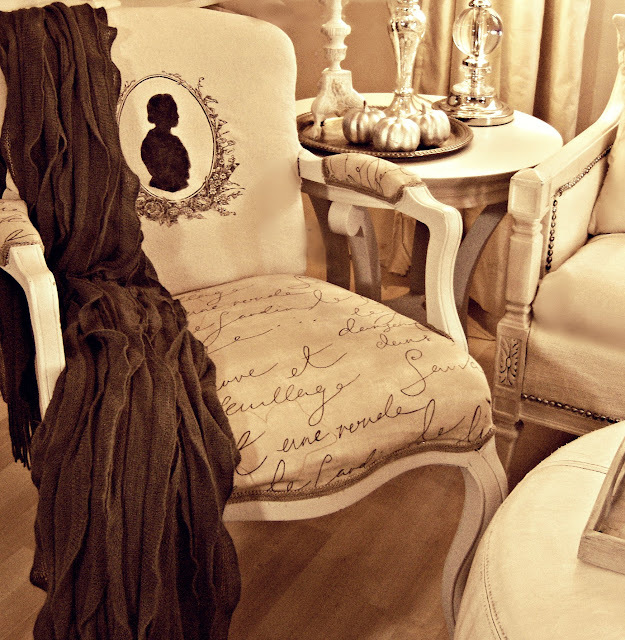 Beautiful Blog and stunning chair. I love what you did to this chair! I am your newest follower. As for that woman at the Good Will? I'd say -- just trip her when you see her walking around. Heh heh heh. I just love this chair! The silhouette and the writing is marvellous. It has inspired me to attempt something similar myself. Many thanks.